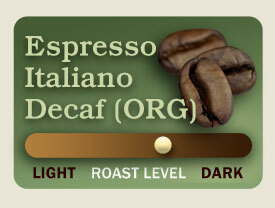 Espresso Italiano Decaf (ORG) -Sample-3 oz. Espresso Italiano Decaf (ORG) -Small-14 oz. Espresso Italiano Decaf (ORG) -Regular-30 oz. Espresso Italiano Decaf (ORG) -Large-40 oz. Espresso Italiano Decaf (ORG) -Bulk-80 oz. Organic decaf version of our traditional Espresso with rich crema, sweet taste and very smooth for straight espresso shots. This is a combination of a Brazil, South American and an Indonesian bean. A secret blend that will please the discriminating espresso enthusiast. Recommend for true espresso machines.